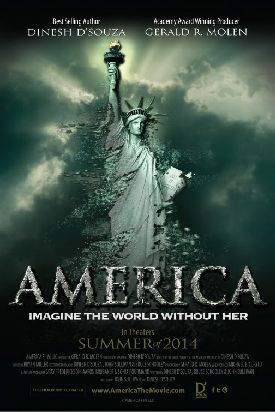 The exhortation in the title of Dinesh D’Souza’s new movie — America: Imagine the World Without Her — suggests that it is going to be an exercise in what they call "counter-factual" history. In other words, imaginary history. History as it didn’t happen. And the opening of the film appears to bear this out, since we watch as an actor (John Koopman) portraying George Washington is shot and killed by a British sniper. Thereafter, however, the alternative history of our country, a history in which (presumably) the Revolutionary War was lost and the United States as we know them never came into existence as a single country, is forgotten, along with all other forms of idle speculation. Instead, we are taken straight into quite a different movie, one consisting of a rapid survey of real American history, organized so as to constitute a refutation of the late Howard Zinn’s People's History of the United States. It should be said that Mr D’Souza’s movie is all the better for abandoning the counter-factual. Every unfortunate student who has been assigned by some left-wing professor to read Zinn’s deplorable and politically tendentious book should see this movie in order to detox. It takes up and answers, one by one, five heads of the progressive indictment of America, as popularized by Zinn, according to her supposed victims. They are, in order, the Indians, Mexico, African slaves — who, after slavery, were also victims of segregation — and the worldwide multitudes suffering to this day under the yoke of American "colonialism" and "capitalism." Together, they make up what Mr D’Souza calls "the Zinn narrative of American shame," and he’s here to prove to us that there is no need for us to be ashamed of it after all. On the contrary, America’s history is something for us to be proud of, just as it was once usual for people to think before the ideologues began writing it. If he had stopped there, I would have no hesitation in recommending this film as an excellent introduction to what had much better be called the shame narrative of American historiography and, thus, to real American history. But he does not stop there. Instead he goes on to yet another movie which bears remarkable similarities to his earlier film, 2016: Obama’s America (2012). In fact, that movie and the second half of this one really belong together under some such title as "Obama’s Secret Plan for America." And my review of the earlier film could also serve for the latter part of America: Imagine the World Without Her. It boils down to approximately this: since we already know what Mr Obama’s non-secret plan for America is and since, further, we also know how damaging that plan already has been and is likely to be in the future, why are we dissipating the energies that ought to be expended in opposing the known plan in order to expose what must remain the rather dubious unknown one? Apart from anything else, there is the simple matter — which somehow always works out to be not so simple — of addressing ourselves to those who do not already agree with us. This is something that Mr D’Souza does very successfully in the first part of the film but fails to do in the second. It is simply the fact, however much we may regret it, that after the debacle of Vietnam — or some time after it was seen as a debacle — Americans made up their minds they were going to revert to the insouciance of the 1930s and 1940s about what was no longer to be called "the Communist menace." The Soviet menace may have seemed a different story after the invasion of Afghanistan, just as the Russian one is making itself clear today, but Reds under the beds, however well-attested any actual Reds may once have been or may be in the future, were to be regarded henceforth and ever after (so far as we can see) as a joke. And it is a joke also eternally to the discredit of the old right, who were illogically but unanswerably assumed to have been wrong about all that kind of thing. This is a good illustration of a genuine popular history, though it is as wrong and stupid as Zinn’s in its own way. That’s a great pity but, as I say, it is the case that most people devoutly believe it. And it gives lots and lots of them, many of whom might otherwise have found themselves in sympathy with this bracingly unrepentant take on American history, an excuse to disregard or ignore it. The same could be said of Dinesh D’Souza’s self-serving suggestion that, having fallen foul of campaign finance laws, he himself is somehow a victim of the repressive surveillance state that he accuses the President of wanting to impose on us. He doesn’t see that his case is weakened, not strengthened, by including a shot of himself in handcuffs, the presumptive political prisoner of the tyrant Obama. I am as opposed as anyone to campaign finance law as it is currently written, but it is patently the product of bumbling do-goodism and not wicked people bent on America’s destruction. I know it’s hard not to say so when you think there are wicked people bent on America’s destruction, but Mr D’Souza ought to try harder if persuasion and not self-promotion is his aim.